This week’s release of Blade Runner: The Final Cut on Ultra HD Blu-ray not only presents the film in 2160p for the first time at home, it also offers a Digital UHD copy from UltraViolet. What’s more, the 4k format from Vudu features the combo of Dolby Vision with Dolby Atmos, both major upgrades from the video and audio formats of Vudu’s HDX format. In effect, most 4k TVs that support HDR will get enhanced color range through the Dolby Vision specification. Dolby Atmos, providing immersive multichannel audio including sound that can be heard from overhead, is available on systems that support the format. 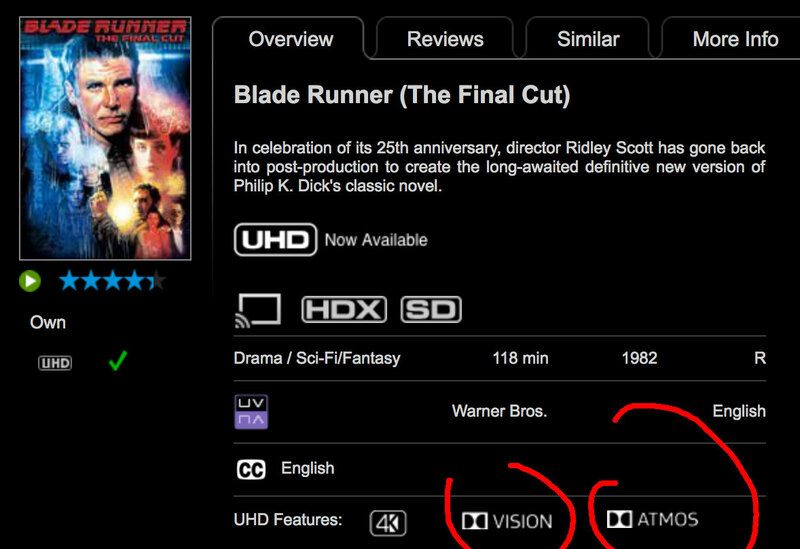 How do you get Blade Runner: The Final Cut in Digital UHD? The redemption code insert from the Warner Bros. UHD BD release directs users to the web page wb.com/redeemdigital. Once the code is entered, there’s a redirect to the UltraViolet website where Vudu is the only option to complete the redemption. If you’ve been sticking to iTunes or Amazon for digital movies and still don’t have an UltraViolet account, this might be a great time to start one. Vudu’s UHD format is playable on supporting 4k TVs from LG, Samsung and Vizio. Dolby Vision HDR is available on several LG and Vizio models. Media players that support Ultra HD from Vudu include Roku’s Premiere, Premiere +, and Ultra, as well as Chromecast Ultra and the Xbox One S. Here’s a detailed list of compatible devices with Vudu’s UHD format, and here’s what Digital UHD titles are available on Vudu. Are you getting a 4k UHD copy through any other digital services? Let us know in the comments below.